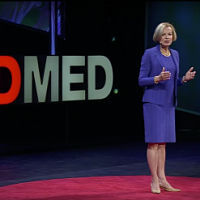 Elizabeth Nable, President of Brigham and Women’s Hospital, professor of medicine at Harvard Medical School. Elizabeth Nabel shares a personally revealing story that shows how the limits of knowledge can be a weakness and how accepting our ignorance can be a strength. “…None of us in science and medicine have the answers we tell you we have, because the universe of what we don’t know dwarfs that of what we do know. “…we’ve talked ourselves into thinking we know – how the body works, how drugs treat disease, how a lot of things supposedly do a lot other things. We are proud of everything we know …but what we have is not knowledge at all. Knowledge has disguised itself as information (and) each bit of new information is but a blip in what we know … knowledge as we know it is fragile and ever-fleeting.